As a member of Allergan’s Brilliant Distinctions program, you’ll earn points for qualifying Allergan treatments and purchases (listed below). Redeem those points for additional savings and exclusive offers and invitations. After you purchase a qualifying procedure, your provider will issue your points. You can also earn points when shopping at the Brilliant Distinctions Mall from brands like J.CREW and more. Best of all, the more points you earn, the more money you save! 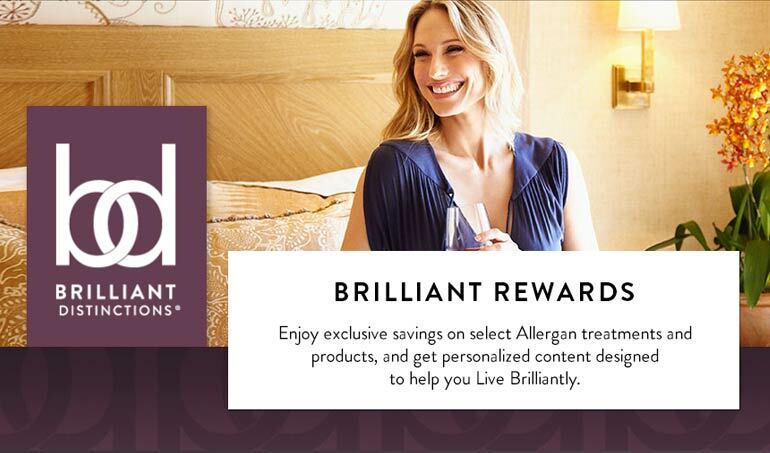 Once you’ve earned points, you can use them to create coupons for dollars off the same qualifying Allergan treatments and products. When you’re ready to use your points, just log into your homepage. You’ll see your available points displayed under activity overview. Then simply click “Create a Coupon” to save up to $80 off your next qualified Allergan purchase. Print your coupon and be sure to bring it with you to your next aesthetic appointment. Remember that coupons must be used within 60 days of creation so don’t let yours expire.